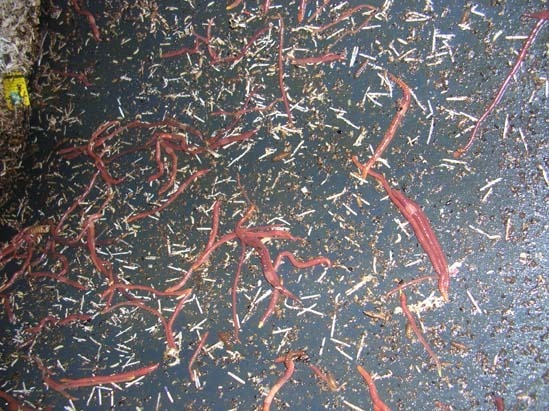 When I saw all the worms up on the walls of the compost bin this evening I realised it wasn’t just up suffering from the heat. Clearly the compost is really ticking over to literally drive them up the wall and our bins are in the shade all day long. I just couldn’t help it. That tune from Kiss Me Kate (1953) and Ann Miller’s dazzling dancing just leapt into my head. So if you have never seen this sit back and watch the incredible Miss Miller as she sizzles, taps and shimmies her way around the room. 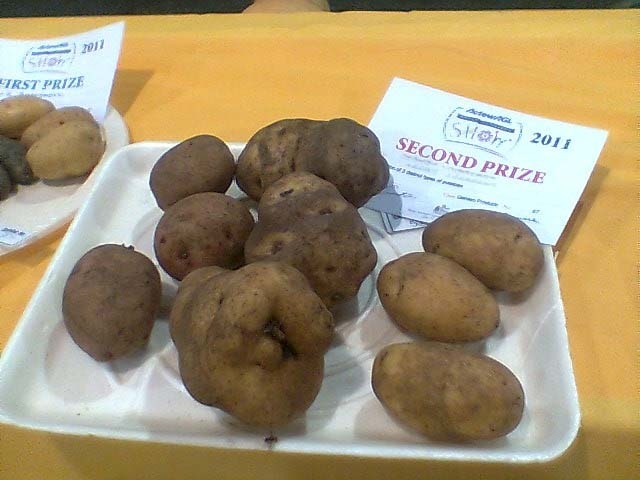 It’s Thursday morning and at 6.30 am I’m out digging up a raft of potatoes for my produce entry at the Canberra Show. Insane I know, but with friends over the night before I didn’t get a chance to do this in advance. I had three potato entries so that was a lot of spuds to be dug. Presentation also requires the potatoes are brushed – not washed – to avoid damage to the skin. So there I was nail brush in hand, brushing, brushing, brushing. Then the green tomatoes and the zucchinis. Bugger one of my tomatoes has been chewed by a vindictive snail so a big hunt around for another set of 3 to enter (most produce entries are done in multiples). Off with the stems. The zepellins are easy to get off the bush the struggle is to carry them inside. Unfortunately some scratches on their skins will detract from my chances. All bagged up and ready to go, only two and a half hours later! It was a busy time once I got to the Fitzroy Pavillion, all the more so because my entry form got lost in the mail. Thankfully the stewards were very relaxed and I only had to fill the form out again. Other stewards were on hand to show us newbies how to set up. Done and dusted with 10 minutes before closing time. Phew! Its Friday night and TB and I are approaching the produce display. TB will tell you I am a tad competitive (well a lot really) so it was with a sinking heart that I looked at my entries, none of which were bearing that small coloured card. Where is that collection of potatoes, 3 distinct kinds? THAT WOULD BE THE ONE WITH THE SECOND PRIZE!!!! Our corn is one of the few things that has been growing and producing consistently this season. So much so that it is becoming a regular on the menu. Indeed it needs to be eaten regularly because fresh corn can actually grow past its use-by date and turn into a mass of small beautifully coloured MDF squares. Last year we left our cobs too long on the plant and had to throw out cob after cob that we literally couldn’t get our teeth into. How do you tell if your corn is ready? As soon as that cornsilk goes a dry and red-brown coloured on top of the cob you should be checking. Peel back the top of the outer leaves of the cob. The silk inside the leaves will still be pale, silky green and still moist (if this is dry then your corn will already be too tough to chew). If the kernels are pale yellow, plump and full (we are growing Golden Bantam so yours may be a slightly different colour), the corn is probably ready. Break one of the kernels with your fingernail is the ‘milk’ that comes out clear = not ready; cloudy = ready; white and thick = past its use-by date. If the cobs aren’t ready put the leaves back over the cob and hold them together with a rubber band if necessary. Check every day. So if your corn goes past its used by day you can give it to your chooks if you have them, or let it dry out and grind for polenta. Last year we saved ours and dried the cobs. I must say that the grinding part the most difficult to achieve. I had absolutely no success with a small grindstone we bought from one of the local Asian shops. As far as I can tell it has a more promising future as a very quaint garden ornament. 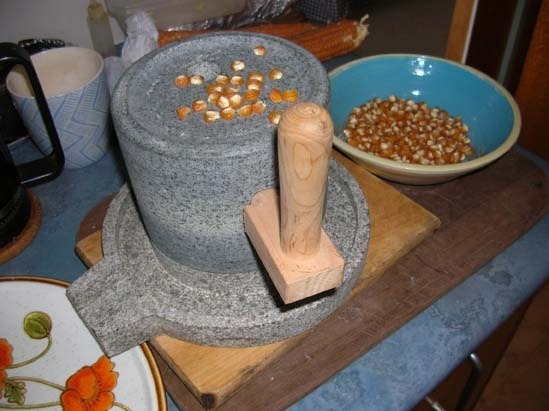 I had some luck with a small electric coffee grinder, and almost equal success with our very heavy mortar and pestle (although with the latter you are in grave danger of losing an eye to flying corn kernels). I’ve had lots of fun reading reviews of corn grinders on Amazon, apparently they are a ‘must have’ item for survivalists! The consensus seems to be that the best (electric) corn grinder is something called the KoMo Fidibus Classic, a mere snip at $US499, a European model. On the hand-cranked side the Imusa Victoria Traditional Corn Grinder $US36 seems to be the go, but of course its temporarily out of stock. I’ll be waiting to see what the shipping price is because I saw the same item on ebay Australia with the most ludicrous shipping price of +$100!! Feel like you are a target for a rip-off? Well I’m not that desperate yet – back to the coffee grinder. 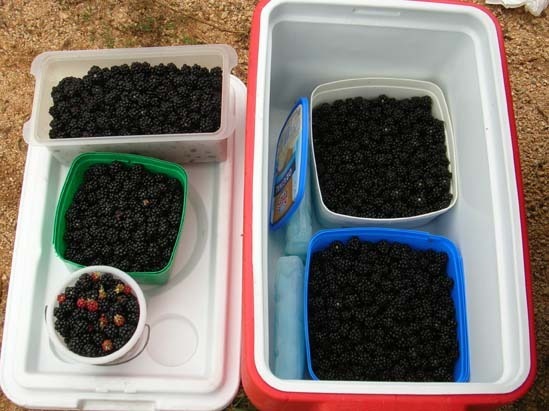 Its the middle of summer – well, so the calendar tells us – and we are off to the forests to collect blackberries, and boy is it a great season for blackberries! The high rainfall this year has resulted in large berries with no discernable drop off in flavour. With friends M & R in tow we headed out to our favourite spot and it appears that we were the first people to pick through the area. 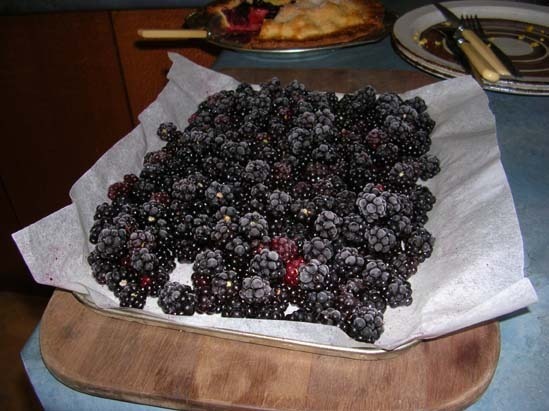 Any of the forestry roads along the Cotter Road is a good place to look for blackberry bushes. 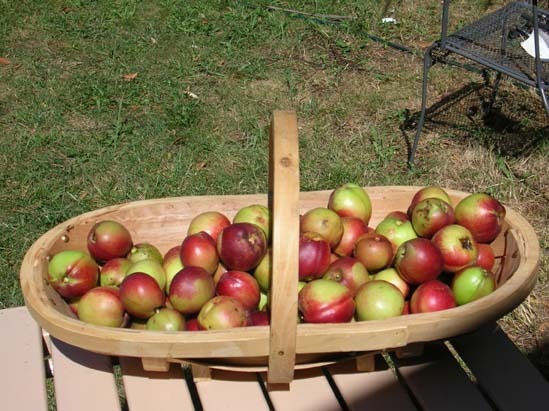 Here is our haul for the afternoon (about 2 hours of picking) – 7 kilos of fruit! Don’t worry there are plenty of berries left and the season should run for at least another month. Of course having picked your fruit you have to store it, or eat it. 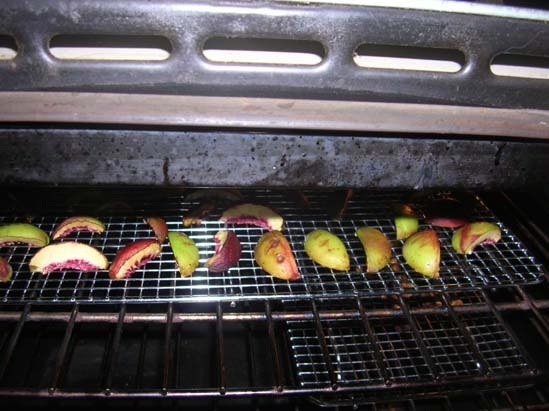 If you aren’t planning to use it straight away I would suggest that you freeze the fruit. The easiest way to do this is to spread the berries out on a tray covered with baking paper. Once frozen they can be transferred into a bag for longer term storage. While reorganising the freezer we found the remains of last year’s berries, so we celebrated by making smoothies. To make your own smoothy mix for two blend 150 gms of blackberries, 300mls of plain yoghurt and 200mls of milk and two dessert spoons of sugar. If you want to make more just double the quantities. Enjoy! The big day has come at last – the grand opening of TB’s first wheel of cheese! Here we are poised to cut …. This is the cheese made from the milk from my sister’s cow. (You can read the back story is here). Despite the colour malfunction the cheese tastes really good. Of course I’m biased, but I did take two precious slices into the office today for a completely un-biased perspective from my workmates – well apart from those people who I still have to do mid-term performance reviews with – and we had the same result. 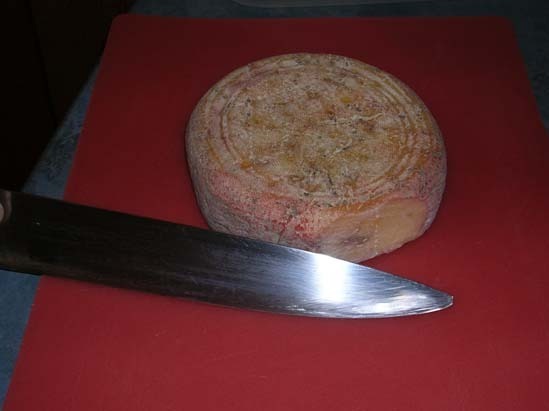 The flavour is pleasant but not overly strong tang, somewhat like Gouda. Universal approbation was received. 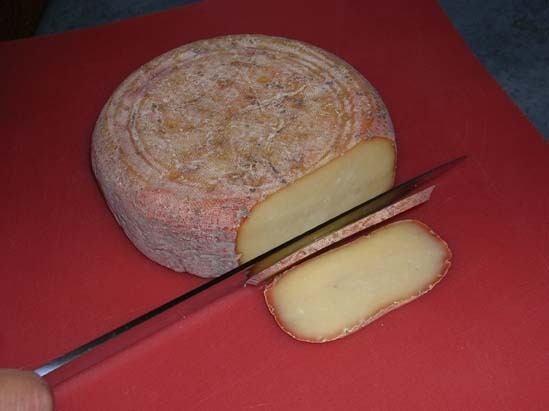 Our biggest problem is that the product of the Fromagerie de Fork is so exclusive that we only have the one wheel of this cheese! Quel dommage! (What a pity!). So I’m sorry Mr Studd you will just have to get in line. Of course we still have the official carving of the ‘Cheddar’ to look forward to come mid-year. Well my timing was a bit off. I had intended to enter the Canberra Show 25-27 February, this year with some of my jams and preserves – entires closed yesterday, rats! However bearing the vicissitudes of veggie gardening in mind the garden produce section is much more lenient with its entry deadlines. Those with produce in their garden have until the 17th to get a postal entry in and late phone entries on the 22nd are permissable, even entries on the day of judging (24th February) are a possibility, but only if space permits. By the way the garden produce section also includes eggs. Having a look at the schedule (available along with the entry form), there are plenty of categories to choose from. Wow, I’ve just discovered that there is actually a class for unripe tomatoes!! things are looking up. We are no where near ready with corn or eggplants, but we can have a tilt at the potato and garlic classes. There is also a school childrens section and a novelty fruit and vegetable sculpture section so get those children working! BTW if you find the inner child in yourself making an appearance there is also an ‘Open’ section in the fruit and vegetable sculpture class. 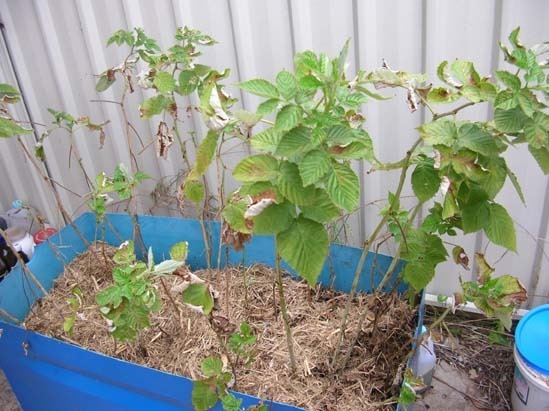 While it is probably not the best time of year for it, I did do some rescue work on our raspberry plants yesterday. They were not in the best of condition having suffered terribly with the hot weather at the start of last week. There were plenty of dead leaves, not to mention last year’s dead canes which still needed cutting out. The soil level was sinking rapidly and the plants hadn’t been fed in ages. 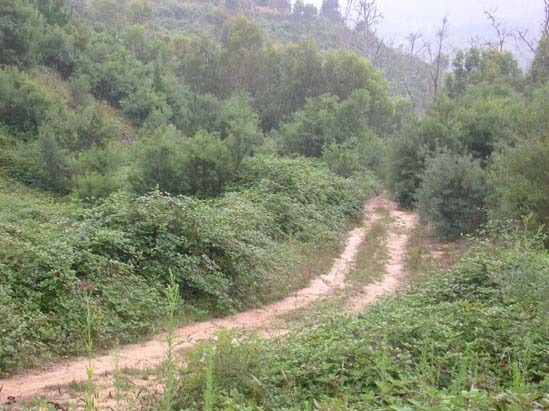 However unlike the fruit trees, and precisely because the plants were too stressed to be bearing fruit, the rain made a positive change to the plants encouraging new shoots at the base of the canes. Having removed what was left of the mulch on the top of the bed I stuck a whole lot of compost into the container. I tried as far as possible to keep it off the new stems so they wouldn’t rot. 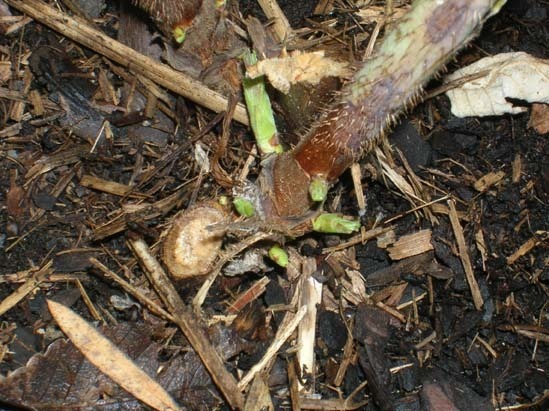 I also left a lot of the dead leaves on the plants as there were plenty of new shoots in the leaf axils and I figured that the old leaves would provide some protection for them if we get some more hot spells. The raspberry container happens to be our old house oil tank cut in half, thoroughly cleaned out and stuck on castors so we can wheel it around. 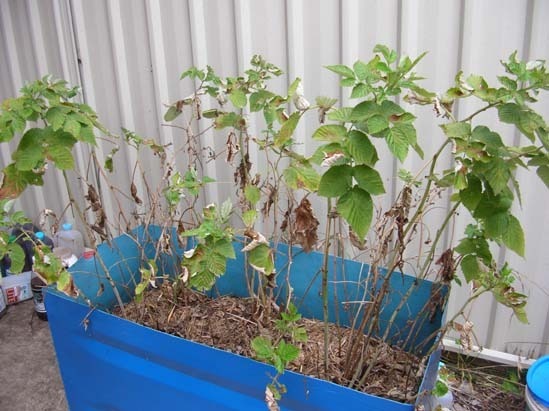 Our other raspberry plant lives (well gets along) in a styrofoam box. Most of the soil appeared, Elvis-like, to have left the container so the soil depth was restricted to only what the roots were hanging on to. This plant got, in addition to a layer of compost in the bottom of its new box, some more potting mix and a further layer of compost and sugarcane mulch on top for good measure. In the past I have pruned our raspberries in late winter and it turned out rather badly for fruit production that year, as it subsequently became clear that I was unable to tell apart the dead canes and the second year canes on which the fruit grows on. At least pruning at this time of year even I can tell what is dead. A good mulch over the top and hopefully we might even encourage the plants enough to produce some more fruit for us a bit alter in the season. If you were in any doubt before I think we can all agree now that we can have too much of a ‘good thing’ – in this case rain – as much of Queensland, Victoria and a fair bit of the Eastern coast can testify! It certainly hasn’t helped our fruit crops either. First we managed to harvest 1 apricot. To quote my old gardening book “Apricots do well when spring and summer are dry …”. The apricot was having one of its quiet years so there wasn’t a mass of fruit to worry about. We actually got the net on the tree before the birds ate everything and then it started to rain. Too much rain as it turned out. The fruit began to split and literally rotted on the tree. In the event we picked and shared the one ripe piece of fruit between us. Last week I harvested my nectarines. Given the proclivity of the local sulphur crested cockatoos to demolish the fruit just before it ripens, it too had been netted at the first sign of avian interest. Given the disappointment over the apricots I was happy to take a photo of my small but useful harvest of nectarines. Again not a big harvest but enough to add to the homemade breakfast cereal. Three drying trays worth. There was no one else to blame but moi! Given that I was languishing inside in front of the fan complaining about the humidity I’m not sure why it never dawned on me to see whether the nectarines felt the same way. It’s a bit hard to go back to the drawing board with the fruit. 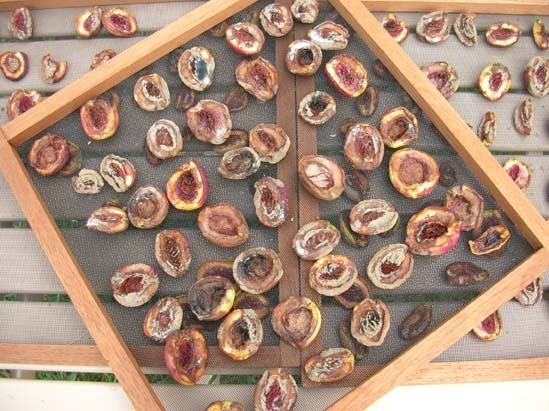 This morning I went down and stripped the last dozen or so fruit from the tree and they are currently drying inside my oven. Who knows I might get enough for one batch of cereal. PS there was also another casualty associated with the nectarine harvest. I managed to stand on my blueberry bush (which is quite small). It didn’t survive the impact. So now we are down another plant. We’ve all been there. One minute you are admiring the flowers on your zucchini plant, perhaps thinking of a cheeky little Italian-style dish of stuffed zucchini flowers. You turn your back for 5 minutes only to discover that a green facsimile of the Hindenberg has moored itself to your zucchini plant. 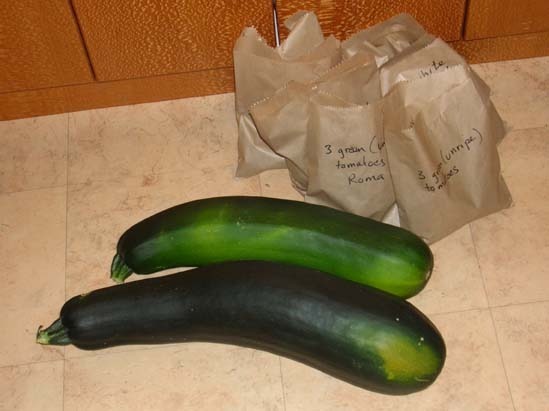 This is the summer zucchini challenge. I have armed myself with two fail-safe recipes, one savoury and one sweet, that help to manage the zeppelin avalanche. Firstly Zucchini fritters with dill, these are guaranteed to appeal even to non-vegetable eaters, (such as some of my family). Its probably because they are fried, but in the bigger scheme of things I don’t think its a problem. The recipe can be found here on that wonderful resource the SBS Food website. For those of you more accustomed to a veggie diet a handful of these can make quite a tasty meal in themselves. You can make a dressing by mixing yoghurt with some dill. 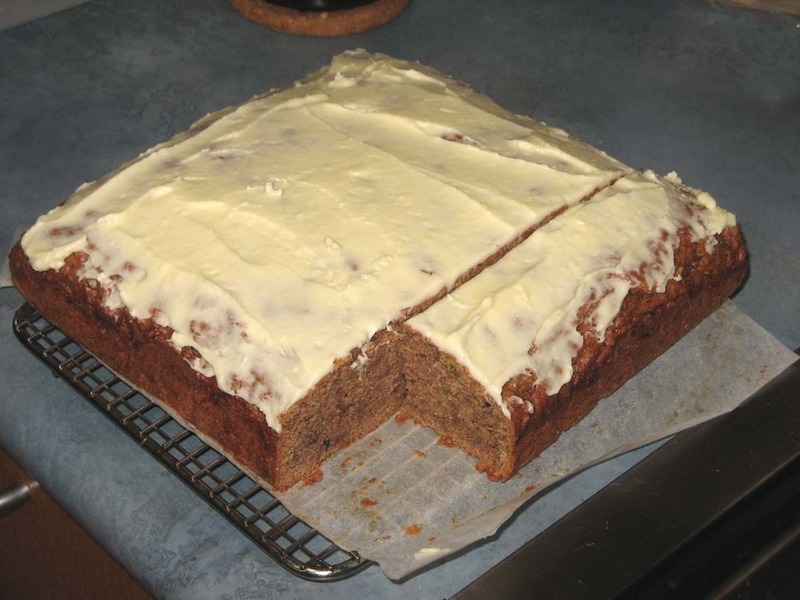 My other recipe also came from SBS Food as Simon Logue’s Zucchini Cake, but I can no longer find the original recipe on the site. As I’ve taken some liberties with the original I’ll give you my version and a variation. Preheat the oven to 180° and prepare your cake tin. This is a big mix – I used a 24 cm square tin, greased and lined with baking paper. Grate your zucchini. Feel free to leave the skin on. DO NOT squeeze the juices out of the zucchini you need the moisture. Blend the sugar, eggs and oil. Add the flour, cocoa, salt and cinnamon (sift the flour if you must but I didn’t do this and the cake still came out well). The mix will be quite stiff at this stage. Fold in the grated zucchini. The mix will now loosen up. Pour into your prepared cake tin and cook for one hour or until a skewer comes out nice and clean. Cool. At this stage you may want to cut it in half and freeze part of it for later. Once cooled you make the icing by beating the butter with the icing sugar and adding the juice and zest. Ice the cake and take a big slice and enjoy! I’ve also tried this recipe with grated carrot and pumpkin or a mix of these veggies with zucchini. If you are using pumpkin you do need to peel the skin off. For both carrot and pumpkin I’d grate it a bit finer than I do the zucchini, otherwise they can be a bit too obvious in your cake. Use same amout or carrot or pumpkin in the recipe above and substitute 1 tablespoon of ginger and 1 teaspoon of powdered allspice for the cinnamon. All other ingredients and methods remain the same.